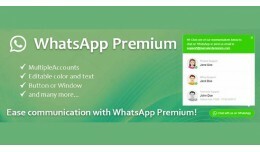 Opencart WhatsApp Premium is a great support extension to ease the communication with your Opencart site visitors instantly. More Information can be found at : Opencart Whatsapp Premium Website Demo here : Opencart Whatsapp Demo Feature..
Opencart Flipbook Premium is the ultimate Flipping book for Opencart websites. You can show 3D, fast loading, smoothly working flipbook catalogs, user-guides from PDF files or images at your store. You can view more details about module : ..